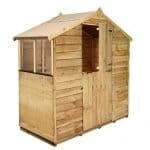 This 8 x 6 Walton’s tongue and groove apex shed is a delightful addition to any garden. It looks very pleasing to the eye, and also has plenty of practical aspects that make it a useful part of your day-to-day gardening. For example, you get a 10mm solid sheet floor, which makes for a very durable and tough base to the building. This solid sheet approach continues to the roof, with an 8 mm solid sheet material fitting there as well. That means you get a nice, durable frame for your shed. Add to that the fact that you have tongue and groove work throughout and you have a tough building that will last for years to come. The first thing we noticed and really liked about the shed is its quaint, traditional design. It’s surprisingly spacious which makes it an ideal choice for those with a medium sized garden. You could easily keep your essential gardening tools, garden chairs, lawnmower and even a bicycle in there. We were also impressed by the high quality finish. The design is flawless with no rough edges or splinters anywhere to be found. With value for money sheds you expect some flaws, but Waltons have done a great job with this model. Solid sheet materials – Both the roof and the floor consist of solid sheet materials for extra strength and stability. These materials offer excellent moisture resistance and also come without knots and voids. 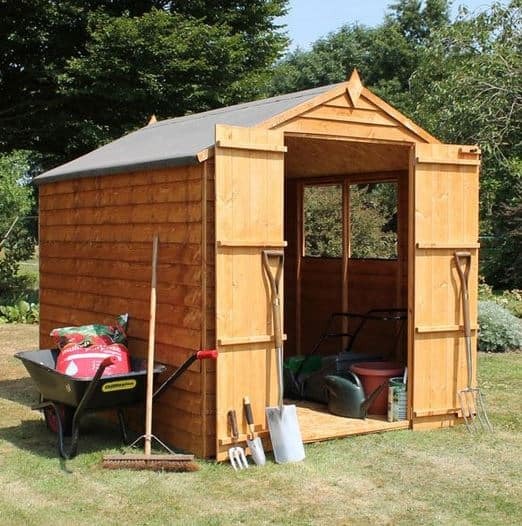 Free roofing felt – Like other sheds in the Waltons range, this one includes free roofing felt to protect against the elements. Made in the UK – Supporting local British manufacturing, the shed is made in the UK which is one of the reasons it comes at such an affordable price. Double framed corners – The double framed corners help to give the shed extra stability and it really strengthens the structure. Ledge double doors – The ledge door design lets you fit a staple and hasp to further secure the shed. 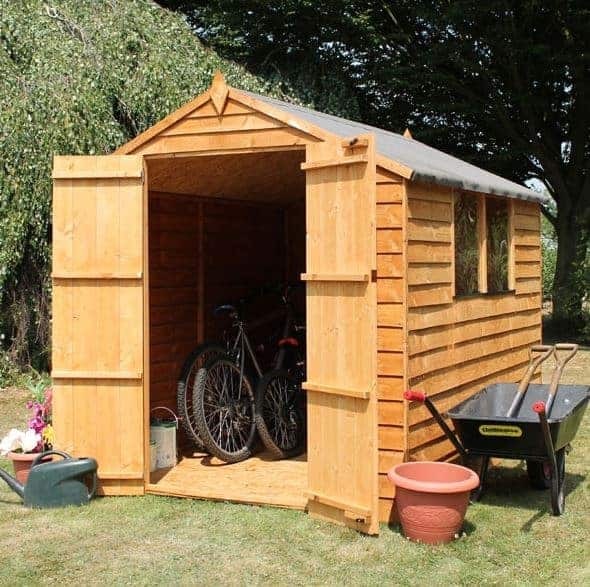 It also comes with double doors, making it easy to transfer larger items in and out of the shed. 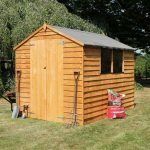 12mm Tongue and Groove Cladding – The standout feature of the 8×6 shed is the 12mm tongue and groove cladding. The interlocking boards help to both maximise its strength and provide excellent moisture protection. Window panel placement choice – The window panel can be installed on either the left or the right hand side of the shed, enabling you to place it on either side of the garden. 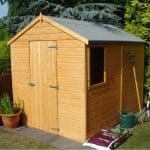 10 year anti-rot guarantee – Durability is one of the main things you look for when choosing a shed so the 10 year anti-rot guarantee is a great advantage. Styrene glazed windows – Styrene is known for its shatterproof properties, making it a safe alternative to glass. 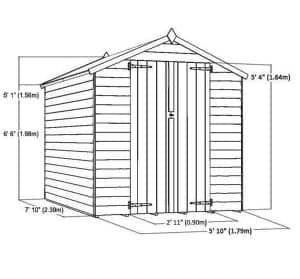 Combined together, the features of this shed help to produce a sturdy, solid and safe structure that should last for many years to come. 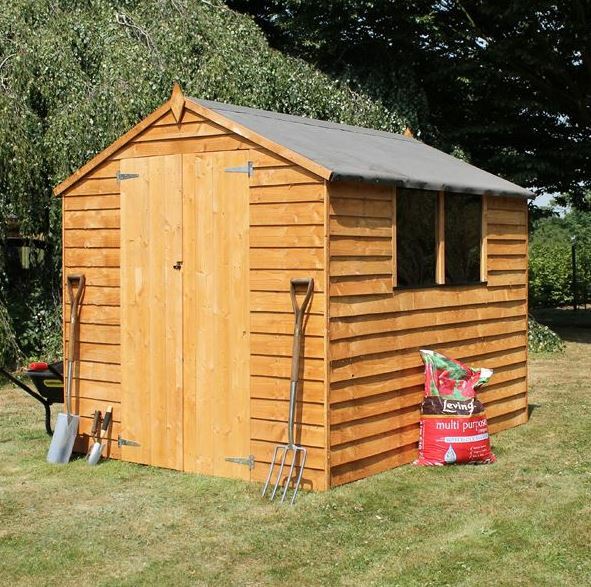 Ensure you measure the space in your garden and take into account anything you want to store in the shed to ensure you are getting the right fit. We’d rate this as one of the safest sheds on the market. It may be a budget model, but that hasn’t sacrificed the quality. 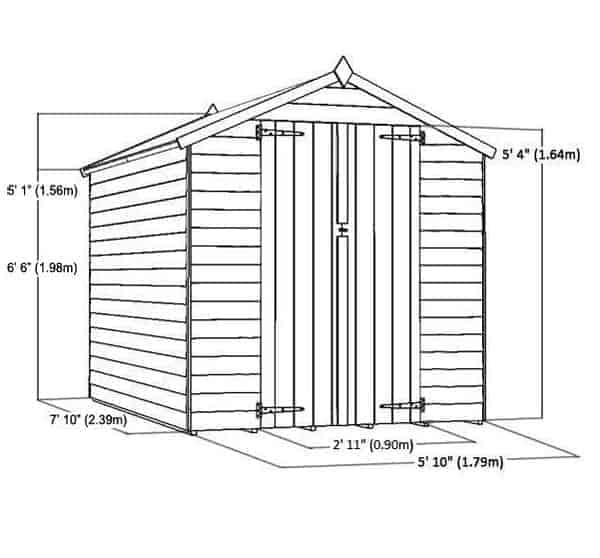 The majority of its features have been included to improve the strength and stability of the shed. 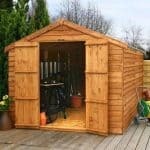 Everything from the shatterproof windows to the Butterfly catch lock helps to keep the shed safe and durable. 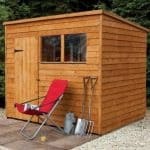 One thing that we’ve always found with Waltons sheds is that they are incredibly simple to put together. The instructions are really clear and easy to follow and it is possible to put it up completely by yourself. However, we would recommend two people to assemble the 8×6 model. Not only will this speed up the construction, but it also makes it easier. As you can see, these extras are designed to help improve durability, as well as stability. 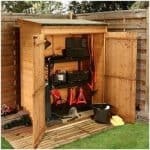 The weatherproof lock also makes sure your shed is locked from prying eyes all year round. So on to the important part – the pros and cons. What exactly can you expect from this shed? Does it live up to the hype? Well we have to say we were impressed by the overall structure. For the cost it has a fantastically strong build. The only thing we can really criticise is the solid sheet materials. They do provide some additional support, but sadly they are a little flimsy. This might not be a major problem as the shed will still hold in harsh weather conditions. However, to give you additional peace of mind we would recommend you invest in the extra support packs. 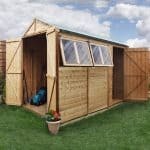 Apart from that if you’re looking for an affordable, medium size shed then this is definitely on to consider. Overall we really like this model. It is solid, weatherproof and comes with great features. It isn’t overly difficult to put together and it should last for quite a few years provided you treat it with a high quality preservative once it has been constructed.